Don't you just love her guard dog? There is nothing quite so sweet as receiving photos/messages from kids and grand kids. Specially ones that include photos. SO sorry to hear you have been sick. Your granddaughter has such a faithful little friend there...very sweet. I pray you both feel better soon. Rosie is the cutest guard dog EVER! My granddaughters live close to me, but I don't see them everyday. I enjoy seeing pictures of the girls on Facebook that their mother shares. I hope you and Lorelei feel better real soon. Awe, I hope you both are better. 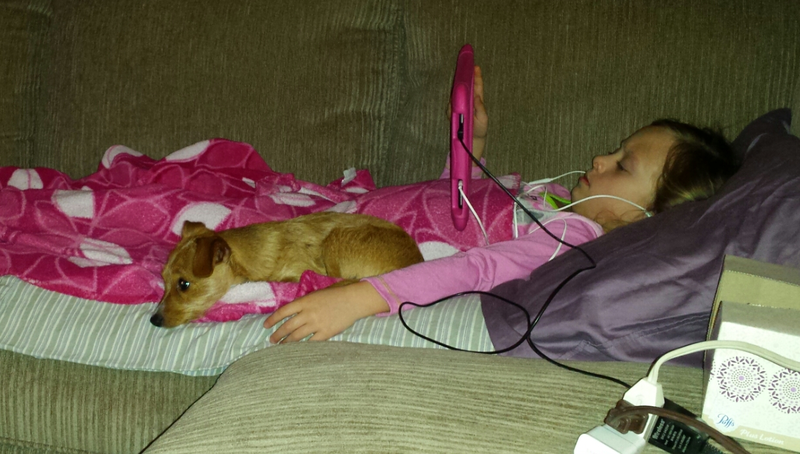 That's the perfect way to beat sickness :) Love her guard dog. Aww, how sweet! I hope both you and her are better soonest! I hope both you and Lorelei are on the way to recovery. That is a sweet guard dog. Well hope both of you are feeling much better. Sweet photos. Pets always help. How to Lorelei's cat and Ottie like the pup? Hello Rose, I hope both you and Lorelei are feeling better. Take care. I hope you have a great new week ahead! How wonderful to have a companion when one is not well. I was wondering how this little girl was doing. Sorry to hear that both of you have been under the weather. Pets are always so loyal to stay near when their owner is ill. I cannot keep your two blogs straight. These photos of poor L are so sweet. 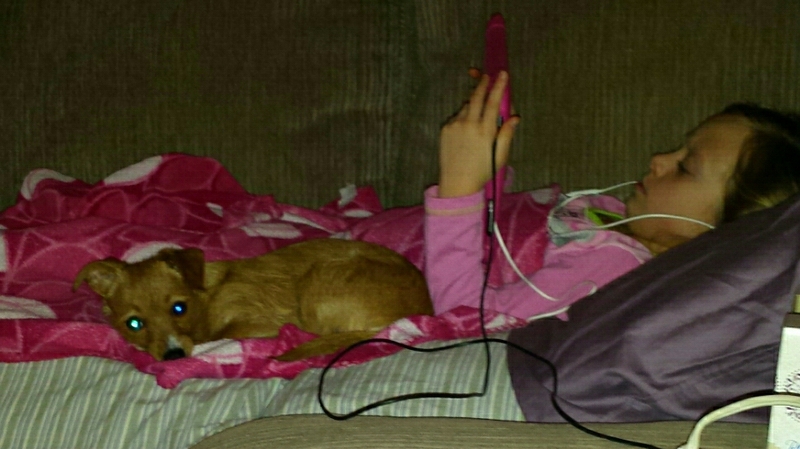 What would our girls do without their electronics at times like these. What did we do??? ?Read a book and do nothing. What darling captures! Lorelei has a faithful companion. :-) Hope you both are back to being well again. I was down for almost the entire month of January with a cold and then bronchitis. Not pleasant. I hope both of you are on the mend. Love the dog "nursemaid."